Nothing gets the endorphins flowing like a thumping bass. Those teeny-weeny earphones that were included for free with your last smartphone just won’t cut it. What you need is a pair of proper cans with drivers large enough to make the air molecules dance to the rhythm. But you don’t want them to dance like a bunch of half-drunk teenagers on their first party—you want the bass to be delivered with confidence, precision, and with respect to the rest of the sound spectrum. To help you avoid purchasing headphones that are not worth your time nor money, we have dug deep on audiophile forums while using our own experience to come up with the definitive list of top 5 best Bluetooth headphones with deep bass for music lovers. 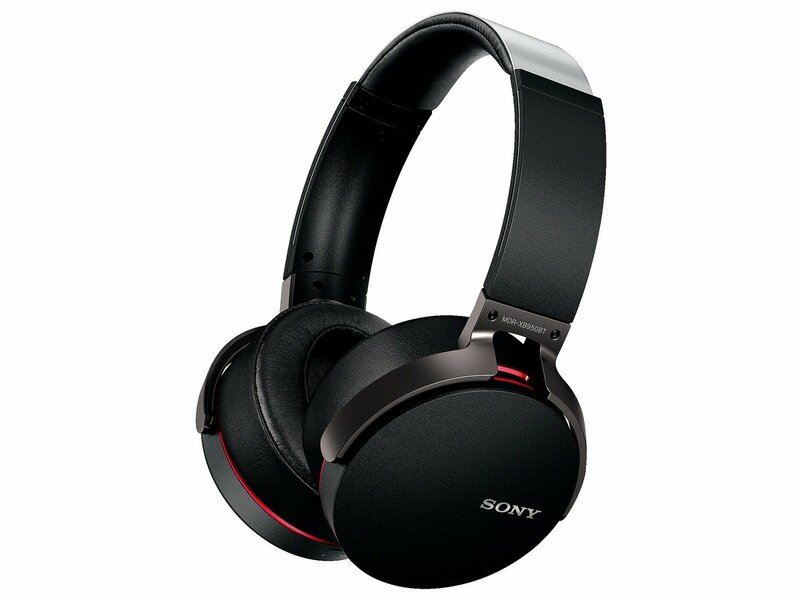 The Sony MDRXB950BT are essentially the Bluetooth version of the popular Sony XB950AP. They share many similarities, both in style and sound, but they are packed with modern wireless audio transmission technologies to give you a taste of wireless freedom. Despite being the most affordable full-sized headphones on this list, the nice textured finish and the lovely red accents around the earcups would likely make you think the headphones cost over $200, even though they retail for just around $120. The cups rotate in all directions, aiding with comfort and enabling the headphones to fit into the optional carrying case that you can buy on Amazon. We would highly recommend that you purchase the case, as the plastic hinges are somewhat fragile. Fortunately, the headband itself is reinforced with a springy metal strip. Sony has put thick earpads on the headphones, guaranteeing you will never a reason to complain about discomfort. 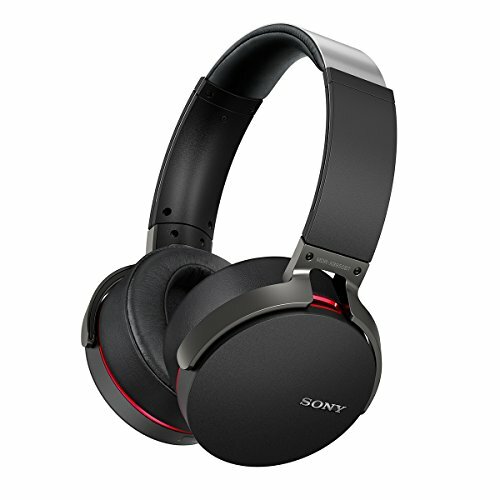 The Sony MDRXB950BT/B are part of Sony’s Expanded Bass series of headphones. All headphones in this series are designed to place an emphasis on the impact of the bass and allow the listener to increase the volume without ruining the overall audio quality. The MDRXB950BT/B, in particular, feature a pair of large 1.54” neodymium drivers with OFC voice coils that up to 1000 mW of power for continuously punchy bass. Burn-in is a term used to describe the period of time from when you take the headphones out of the box to when they open up and begin to sound the way they were intended to sound. Depending on the headphones, this can take anywhere from several hours to several days. Usually, the larger the drivers are the longer it takes. And the drivers inside the MDRXB950BT/B are huge, so be prepared to give the headphones a few days. When they finally expose their true nature, your ears will be greeted with excellent lows that work great with just about every electronic music genre, as well as with hip-hop. If you ever need even more bass—perhaps to shuffle your brain cells—you can activate the Bass Boost feature. Keep in mind that it works only in wireless mode. Sony has implemented all the latest wireless technologies, including APTX, AAC, and NFC. The last one mentioned allows you to pair the headphones with your smartphone just by placing the two devices near each other. You can expect around 20 hours of battery life on a single charge. Plantronics has decided to expand their range of wireless headphones with the BackBeat PRO, their first full-size Bluetooth headphones. Instead of going after the same market segment as Beats, the company targets business users and office workers. Indeed, the BackBeat PRO have a professional vibe to them, with their all black design and clear preference of function over form. Opinions vary about what makes a pair of headphones suitable for business use, but almost everybody agrees on one thing: comfort is paramount. The Plantronics BackBeat PRO have huge earpads that completely wrap around your ears, making you feel as if you are being cuddled by two soft pillows. The ample padding makes you completely forget about the weight of the headphones, which sits at 340 grams (12 ounces). Even though these headphones feel most at home in the office, their foldable construction and active noise-cancellation make it possible to take them outside without any serious complications. We were surprised by the degree to which the active noise-cancellation was able to mute outside noise and allow us to focus on our music. In addition to the noise-cancellation, the headphones also come with a handy carrying pouch and an audio cable with microphone for wired listening. According to Plantronics, the headphones deliver “all the rich bass, crisp highs, and natural mid-tones of your music and media.” We have to say that Plantronics is right—the BackBeat PRO really sound great and, at times, make you feel like you are sitting in a large concert hall. By default, they place slight emphasis on bass but not enough to make them unusable with any other music genres besides hip-hop and EDM. You can, of course, increase the bass using software equalizer, and the headphones will happily oblige. Minds are harmonious and highs are especially clean, especially considering how the lows sound. The Plantronics BackBeat PRO feature an easily accessible control hub, which can be operated blindly, giving you access to all common controls and features. Pairing the headphones with your smartphone or tablet takes just a few seconds, using the NFC technology. Plantronics has fitted the headphones with a whole range of power-saving features, including the ability to automatically pause the streaming audio and active noise-canceling when you take off the headphones and a DeepSleep hibernation mode. The company’s efforts have paid off, and the BackBeat PRO last up to 24 hours of continuous wireless use. To stand out in the crowd, headphones manufacturers have to come up with increasingly crazier takes on the traditional headphone formula. Bluedio, an innovative mobile audio and communication solutions manufacturer with more than 30 patents under their belt, has taken inspiration from the classic design of vinyl records to create the Vinyl Plus headphones. With their twisted metal band and very large circular earcups, they stand out in the sea of seemingly identical headphones that make up most of Amazon’s inventory. 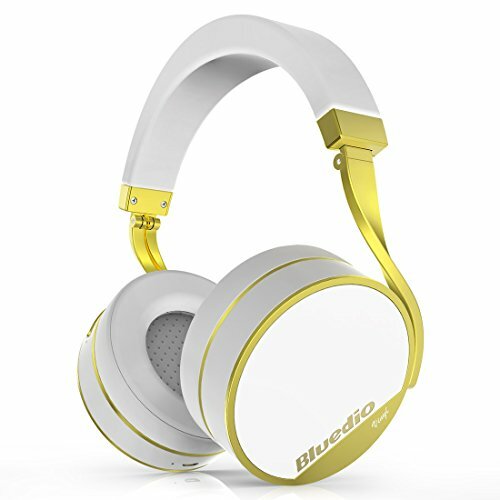 But despite the apparent attention to design and style, Bluedio haven’t failed to build the headphones to the highest standards of durability and comfort. The large, squishy earpads with memory foam are well ventilated, preventing them from turning into a hot oven for your ears. The pressure feels just right—neither too light nor too tight. With large enough playlist, we can definitely imagine wearing these headphones until they run out of juice, which happens only after approximately 20 hours of continuous listening. The amazing value offered by these headphones is even more apparent when you consider the accessories. You get the headphones themselves, 3.5mm audio cable, charging cable, Y cable, cable with remote and mic, carrying case with a buckle, storage pouch for cables, and user manual. 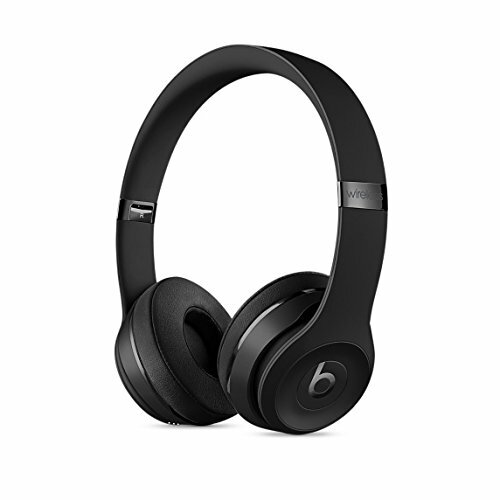 Even though the Beats Solo3 look nearly identical to the previous generation, a lot has changed on the inside. The Solo3 use Apple’s new W1 Bluetooth chip, which dramatically improves battery life and signal strength and simplifies pairing with Apple devices—but only with Apple devices. You see, to take full advantage of what the Solo3 have to offer, you need to own an iOS device, ideally one with a W1 Bluetooth chip. iPhone owners will be able to instantly pair the headphones with their smartphone simply by hitting the “connect” button, which pops up instantly on the screen the moment you turn the headphones on. Android users have to go through the same old pairing process, just like with any other regular Bluetooth headphones. Luckily, both iOS and Android users can enjoy the massively improved battery life, which now hovers at around 40 hours. That’s a jump of more than 12 hours over the Beats Solo2 Wireless, making the Beats Solo3 the longest lasting pair of Bluetooth headphones on the market. What’s more, it takes just 5 minutes of charging to have enough juice for 3 hours of playback, thanks to the presence of a quick charge technology. 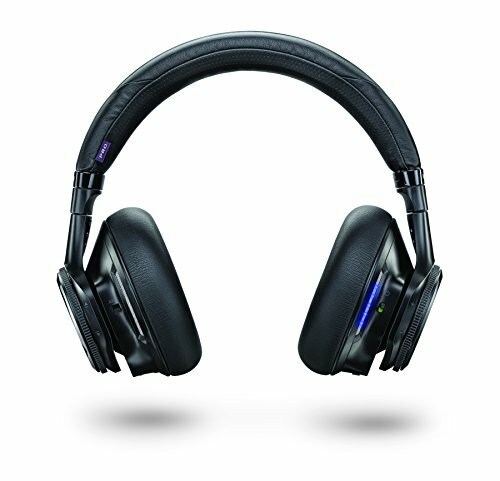 The new chip also provides a stable and strong signal strength that greatly surpasses most other Bluetooth headphones. Located on the earcups are on-ear controls for taking calls, controlling audio, and activating Siri, as well as a built-in microphone of a decent quality. Contrary to Apple’s push for the new USB-C connector, the Beats Solo3 stick with a Micro-USB charging cable. But the million-dollar question is how they sound like. If you have listened to the previous generation, you already know how. The overall sound is tuned to appeal to bass lovers who value powerful lows over balanced sound and clarity. That being said, the Solo3 are surprisingly detailed, with highs that punctuate the massive barrage of air pressure from lows and mids. 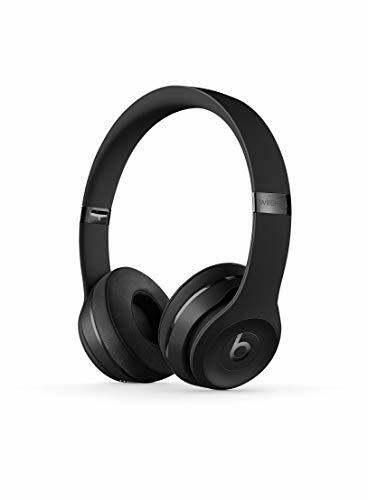 Their decent passive noise isolation and compact size make the Beats Solo3 be a perfect everyday companion for every city-dweller who revels in brain-shaking drops and eardrum-piercing kicks. TaoTronics, a leading consumer electronics brand operating around the globe, has been in business since 2008, offering millions of customers highly affordable Bluetooth headphones that hardly ever fail to amaze with their value and sound quality. The TaoTronics In-Ear Bluetooth Headphones are no different. These small, discreet Bluetooth 4.1 headphones support the aptX codec for CD-like wireless audio quality and smooth audio without breaks or interruptions. They are designed to work both with iOS and Android devices. A single multi-function button allows you to access your intelligent voice assistant of choice, and the built-in microphone ensures that your words won’t be misunderstood. The headphones are IPX5 water-resistant, meaning they are protected against sweat, light rain, and the occasional splash of water. In other words, don’t take them underwater with your but don’t be afraid to use them in any weather and for any activity. Their comfortable and secure design fits great around the ears, keeping the headphones in place while jogging, running, or exercising. It also guarantees tight seal, which is a prerequisite for a good sound quality. And the TaoTronics Bluetooth Headphones sound surprisingly good. So good, in fact, that we had trouble believe that you can get them for just around $25 on Amazon. 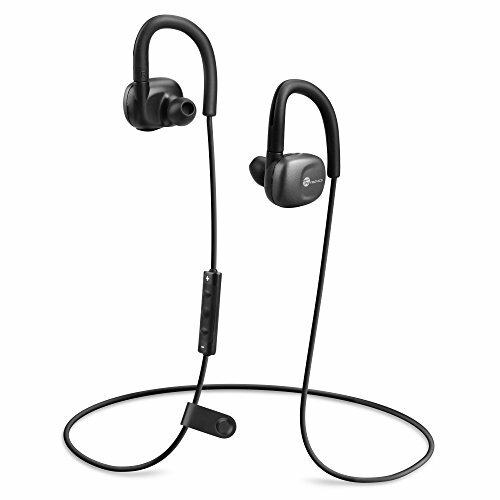 For that kind of money, they the TaoTronics In-Ear Bluetooth Headphones are a steal and we highly recommend them.